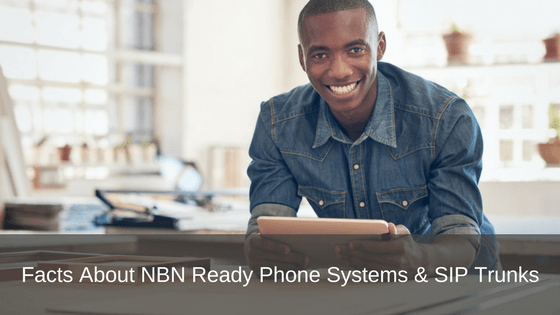 With the NBN roll out in full swing across the country, it’s now imperative to be in the know with NBN-ready phone systems for your business. SIP trunk plans and business VOIP plans will be part of a new lingo you come to know so well. Most people are aware the NBN will eventually supersede analogue phone technology. With this system in place, SIP phone plans will become a new norm and we will say goodbye to complicated business phone systems and high phone line rental costs. But, here are a few things people may not know about SIP trunk plans and call rates, and VOIP bundle plans for business. What do SIP trunk plans have to do with the NBN? In a nutshell, businesses that operate with one single phone line can generally be ported quite simply to the NBN on a bundled service. But for the majority of businesses that operate with multiple lines using a PBX phone system, it becomes a little more complex. This is where SIP trunk plans and service come into play. Multiple phone numbers need to be ported to a SIP trunk service or a hosted PBX service. A SIP trunk service and PBX are business VOIP systems that operate across a quality internet service like the NBN. With the right guidance, it is relatively easy to change a service from PSTN or ISDN to SIP. When is the best time to move to a SIP trunk plan? The transition period can get a little tricky for some customers and leave it too long – you could experience some pretty lengthy connection delays. If you have not made plans to get your business phone system NBN ready yet, we suggest that now it the time to do so. Most hosted PBX systems are compatible with an ADSL connection. Getting your phone system NBN-ready now will make the change seamless when your area is up and running with NBN. Remember, this transition will affect all businesses in Australia – don’t get caught in a last-minute rush. The transition of your business phone system will also require investigation into SIP trunk providers and subsequent SIP trunk phone plans and call rates for your new system. A little more about this soon. What is involved in converting to SIP? Transitioning to SIP trunk requires clever coordination of SIP and your current business phone system. Some multiple-phone line businesses may have PABX hardware problems when changing to SIP trunk. We explain these in the following three scenarios. These business phone systems will likely require minor modifications. It could be as simple as installing a SIP trunk-capable card then configure the SIP trunks. Businesses with these phone systems would have recently purchased them. A software upgrade may also be required. This is relative to business phone systems that are not capable of having a SIP card installed. Instead, they have the capacity to enable SIP trunking, on a limited scale, through added an Analogue Telephone Adapter (ATA). Phone system functioning can be limited by this method. A PBX maintainer would connect an ATA to your business phone system. This is not a premium conversion process and is not generally recommended for more than 8 phone lines. On a positive, an ATA conversion is usually quite cost-friendly. Moreover, you may be able to use your current business phone system. Some phone systems have worked their purpose but are just too long in the tooth to be upgraded to NBN-ready or SIP trunk capable. These systems will need to be replaced. The positive with changing to a new phone system is that you are gaining the most advanced and current phone technology. How to find a SIP trunk provider and SIP trunk phone plan? The key message here is not to leave it too late. You could troll the internet and make endless phone calls to find a SIP trunk provider and SIP trunk phone plans, or simply let our team do the work for you! For more information or help with deciding on the best communication system for your business, contact us today for expert advice – call 1800 007 229 or visit www.prosum.com.au. We will get your business phone system NBN ready.